These dividing plates will allow a higher degree of precision in hole placement, spot facing and even gear cutting to any rotary table. And with a tailstock, the support you need for longer workpieces is covered. 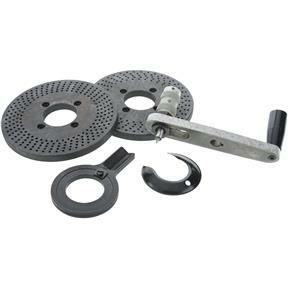 Fits our Model G9298, G9299, G9300, G9292, G9293, G9294 and G9305 Rotary Tables. Exactly what I was expecting and as described good product. Glad I bought this along with the 8" rotary table, G9298. Simple bolt on installation(had to watch a few youtube videos) the instructions included are useless, but it does bolt up perfectly and simply to the G9298. Only complaint is that the adjustable hole counter is plastic, I've seen brass ones.